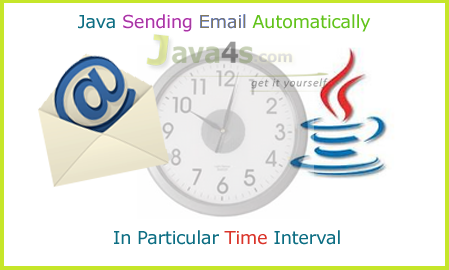 Send Java EMail in Specific Time Interval Automatically & Dynamically. Let us see how to send automatic and dynamic email using Java, this application will send email in fixed interval of time, even if you want you can change this application to send email every day at particular time :-), to wish your friends/family. #start after 2seconds for first time..
hi frnd,this is really awesome tutorial for java developers ,actuallly when iam trying to execute this example im getting error follws…. sir from where i can download BarCode128Java4s.java file….please give me the respective link..
Gud job….. Thanks a lot…. Is it recommended to use “Timer” in Java EE web applications? I want to integrate this scheduler to my project. i need to check first that does the costumer has given his feedback, if not then after 20 days i want to send a reminder to saying “give feedback”. how can i do that my project is on java using jsp & servlets. java4s is really worth it. HI,FRIENDS I GOT THIS ERROR.PLEASE HELP. thanks,this is very good example and it is working.My problem is that execute query everyday on a specific time period and result is automatically attached it as a attachment and mail to other mail id .how to make it possible please reply me.I am very thankful to all….. The code works great. Mail is sent to the Email ID specified. How to include that .properties file to the JAR File? Sir, I am getting error in ReadPropertiesFile may i know why?